• Click on “news” for event information. Sometimes a work of art just makes a viewer ask, “Huh?” Nontraditional artist Bridget Freeman Wamsley is OK with that. Although skilled in drawing, Wamsley chooses to focus more on a relatively new type or movement of art called social practice. To simplify it, a flash mob could be considered social practice. Wamsley has big ideas. Using her theatrical skills from years of participating in community theater, Wamsley takes common subjects and finds ways to convey the subject’s importance visually, attempting to be a catalyst for communal understanding or conversation. In a piece titled “What’s Your Birthday,” she wore a sandwich board that asked for the birth dates of passers-by. Standing in high-traffic areas for a few hours a day for 30 days, she documented strangers writing the dates on the board she wore. Afterward, she displayed the boards as well as the photographs she took of smiling strangers whose birth dates she knew. Another piece shows 420 deteriorating M&Ms laid out in circular patterns that lead into two vintage clutch purses. Wamsley describes it as a grand map of her reproductive life; the purses represent her ovaries and the M&Ms are cycles. Wamsley, 47, has always been creative. In a sense, she has been working toward her college degree for more than 30 years, involving herself in creative endeavors from restoring carousel horses and drawing portraits to volunteering for the Spokane Symphony Orchestra and Spokane Civic Theatre. Now, Wamsley is making it official: In June, she will graduate from Eastern Washington University with bachelor’s degrees in studio art and art history. 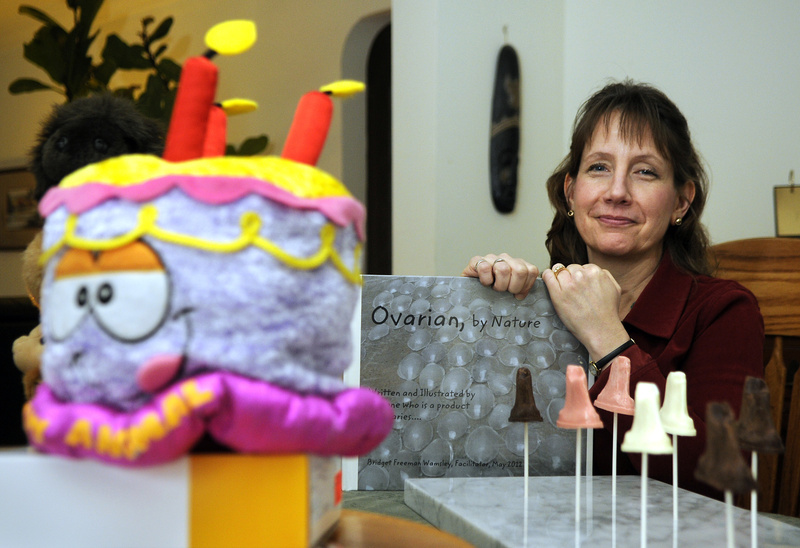 Her culminating project for the studio art degree will be a retirement party for her ovaries – now that she is beyond her childbearing years – on May 17 at The Fox theater. Anyone may attend, and representatives from the American Cancer Society will be there. While social practice might be a form of art that some people have a hard time wrapping their minds around, it does get them thinking.